How to live longer by changing your diet? Longevity is directly related to a healthy diet because it prevents chronic diseases such as cancer, osteoporosis, heart disease and others that are a major cause of aging. After 40 years, inevitably there is a significant physiological changes the body – the activity of protective systems falls, decreases the amount of collagen and elastin (the skin becomes drier, thinner, loses its elasticity, wrinkles appear, the bags under the eyes), reduced energy metabolism in cells, worsening blood and oxygen saturation tissues, decreases the activity of hormones, changes the metabolism and start to appear the first signs of aging. The modern pace of life in a negative impact of urban ecology is able to accelerate and exacerbate these processes through disruption of recovery mechanisms (wrinkles, sagging, dryness, age spots, etc.). Experts advise those who want to stop the rapid aging, stick to a specific diet, the meaning of which is to reduce the number of calories compared to the established standard consumption by an average of 30-50%. Such a diet will help you slow down the aging process and increase life expectancy and also to improve the general condition and prevent heart disease and brain, metabolism, etc. What products are included in this diet? Doctors conducted a series of experiments and concluded that people age much more slowly if in the diet they have products such as vegetables, lean meats, oily sea fish, whole grains, nuts, olive oil and fruit. Moreover, the amount of bad cholesterol at them about 30 percent is lower than at those who do not adhere to this diet. In the morning after sleep, drink a glass of water. For breakfast, eat one egg and 2 of any fruit or a bowl of oatmeal with a spoonful of vegetable oil and fresh berries. For lunch, prepare 200 g of cooked salmon, 100 g of vegetables, dressed with olive oil, lemon juice, and fresh berries. In the afternoon, eat a cup of yogurt, a few nuts, and green apple. Boil for dinner 200 g chicken breast cut into a salad of tomatoes and cucumbers, dressed with olive oil. Eat 1 – 2 fruit. Before going to sleep, can have a cup of yogurt or other fermented drink. In between meals, drink green tea with lemon and a teaspoon of honey. Our food is made up of three main components: proteins, fats, and carbohydrates. And all of them are necessary for the full activity of the body. Watch portion sizes, if you are over 50, replace the plates for hot food on a small salad plate. Do not forget that large portions at restaurants will cost you dearly – you’ll wear all these “bonuses” around the waist. Eat little and often. Do not eat on the go. This method improves the digestion and absorption of nutrients. In addition, frequent meals relieve you of necessity “to have a bite” by less nutritious heavy food and drinks. Carbohydrates are divided into simple and complex. Simple carbohydrates are made up of glucose and fructose. They are found in foods such as all kinds of baked goods, cereals, rice, pasta, potatoes, milk, fruits, some vegetables, any sweets, beer, fast food and other products. Complex carbohydrates or polysaccharides found in vegetables, fruits, legumes, meat, nuts, grains, fiber plants, and berries. Reassess your diet in favor of complex carbohydrates. Remember, simple carbohydrates cause a sharp rise in blood sugar, and immediately processed in excess fat. Complex carbohydrates, as opposed to simple, digested more slowly and do not cause a sharp rise in blood sugar. Proteins are the building blocks of muscle, cell walls, fibers. Many products of animal and plant origin contain protein. Products containing protein in large quantities: meat, fish, dairy products, eggs, nuts, grains, soy. The proteins contained in foods of plant origin, the least price, because they are poor in amino acid composition, as well as less digestible than proteins contained in animal products. Begin the meal with a protein food, as it requires more time for digestion and slows down the absorption of glucose from carbohydrate foods. Then eat vegetables and leave at the end of complex carbohydrates. Water and other liquids weaken the action of digestive enzymes. Particularly harmful ice water, because cold reduces the activity of the stomach. A pleasant exception to this rule – a little dry wine, it is better to drink with food. The estimated daily intake of fluid is calculated at the rate of at least 300 ml of fluid per 10 kg of body weight. For example: with a weight of 70 kg each day to drink about 2 liters. Note: Water is involved in almost all the chemical processes that occur in the body. It is not surprising that without sufficient liquid adverse changes in the body and aging will begin earlier. Drink clean water, fresh juices and green tea, a recognized health elixir with a rejuvenating effect. But about alcohol, carbonated drinks, and strong coffee better forget it. 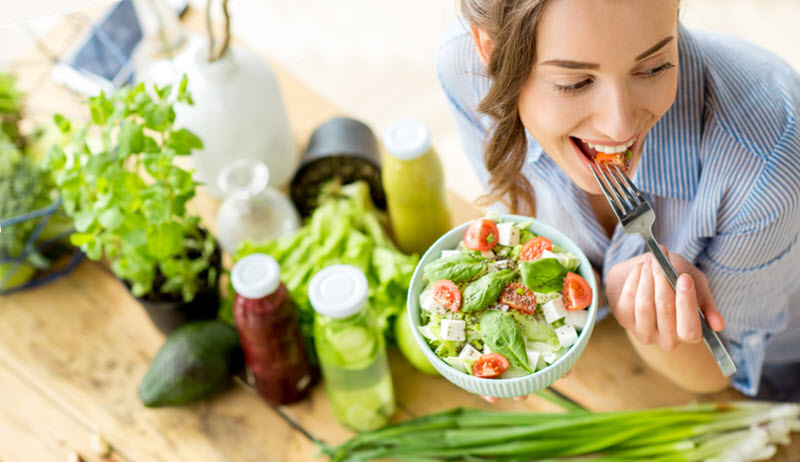 German scientists have found that the skin of people who often eat fruits and vegetables, much later, wrinkles than those who choose to eat meat, protein and carbohydrate-rich foods. The best fruits and vegetables bright orange and red. Characteristic bright coloring gives fruits and vegetable pigment carotenoids. Orange vegetables and fruits have strong antioxidant effects, which prevents the cells to oxidize and protect them from destruction. This explains the absence of wrinkles in people eating so bright fruit. Besides fruits and vegetables rich in vitamins. Very useful in this regard are the melon, apricots, and mangoes. Use only high-quality vegetable oils containing unsaturated fatty acids are necessary for the normal supply of cells and preserve youthful skin. If you regularly eat oily fish, use olive oil for salad dressing, eat walnuts, pumpkin seeds and sesame seeds, it means that your body is getting enough of the Omega-3 essential fatty acids. These acids help to extend the life of cells, that is, slow down the aging of the tissues, prevent the development of atherosclerosis, Alzheimer’s disease and other ailments that occur in the elderly. The smaller irritants around you, the more chance you have to enjoy the food. Slow chewing improves digestion and assimilation of nutrients.